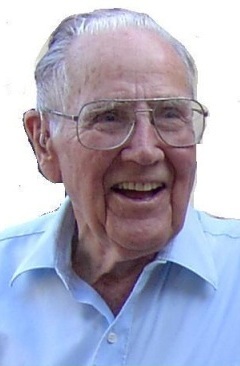 John Pat Cooper died on Saturday, November 8, 2008 in Santa Barbara, he was 91. Son of Justin and Francis Cooper, he was born and raised in Tigard, Oregon. He was a student at the University of Oregon, and worked on a U.S. Forest service crew clearing brush in the mountains of Oregon during the depression in the 1930’s. He first came to Santa Barbara in the 1930’s with his father. While there, John met the love of his life, Elizabeth Bent. They were married on July 15, 1939 and they were able to celebrate 57 years of marriage before she died in 1996. John served in the Army Air Corps during World War II, where he was in pilot training. Upon honorable discharge in 1945 he returned to Santa Barbara. He was enrolled at Santa Barbara State College (which later became UCSB), and worked for Ambrose Mill and Lumber as a millwright, then as a repairman for General Telephone, and finally for the Santa Barbara City Schools as a carpenter. He found time and resources to build a home on the Westside of Santa Barbara and raise a family of four children. They include son Mark Cooper of Ventura, daughter Holly Cooper of Atascadero, son David Cooper of Fremont, and daughter Meredith (“Marti”) Cooper Furman of Santa Barbara. He has three grandchildren, Jeniece and Joshua Cooper of Atascadero, and Katie Furman of Santa Barbara. He started building his fine home in 1949 and completed it in 1991. He built it room-by-room with relatively little money and without the need for a mortgage. It was always a great source of pride for him. He was very involved and supportive of his church The Worldwide Church of God in Port Hueneme, for over 30 years. Also, for over three decades he walked down and up the steps to the beach on Mesa Lane (Thousand Steps). He loved the ocean view, the wildlife, and especially the people and their pets. Beyond his family and church, his greatest love was woodworking and especially fine cabinet inlay. The legacy of what he has left in beautifully intricate inlay is simply astounding. He will not only be remembered through photographs, but in the joy many of us will have in looking at his phenomenal creations in wood every day. There will be a Celebration of Life for both John and Elizabeth Cooper at their Westside family home at 12:30 p.m. on Sunday, February 1.